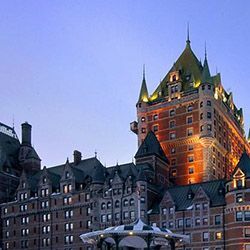 The iconic Fairmont Le Château Frontenac has undergone a multimillion dollar renaissance project that blends the charm of the hotel's enchanting past with modern innovations. This heritage urban resort will seduce you with its breathtaking views of the St. Lawrence River and the architecture of the Old fortified City, designated a UNESCO World Heritage Site. 611 guestrooms and suites offer an elegant touch of historic Europe. Fairmont Gold, the private concierge floor experience, features exclusive amenities and highly personalized service designed to exceed the expectations.